The TUP500 Series is a high speed, cost effective, open frame or modular printing solution with superior Star build quality designed especially for kiosk environments or for unattended printing applications. 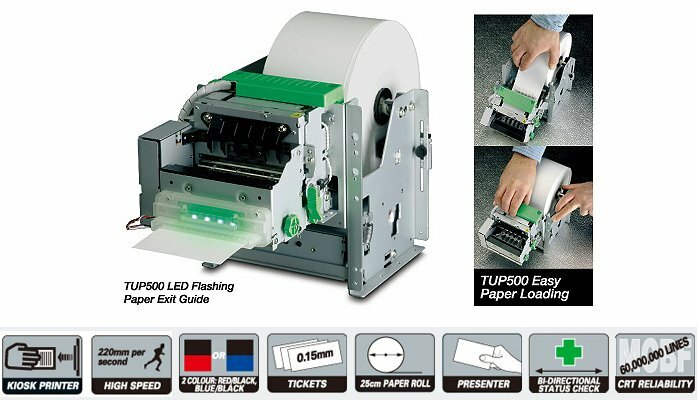 With a fast print speed of up to 220mm per second (with standard 15cm paper roll) and capable of printing on media up to 0.15mm thick, the TUP500 is ideal as a fast, reliable receipt or ticket printer for kiosk environments. The TUP500 is available as a complete open frame unit with presenter and document capture function or each module is available to purchase separately. Star Micronics has been supporting resellers in Australia for more than 30 years. Complete our simple registration process here for eligible resellers.